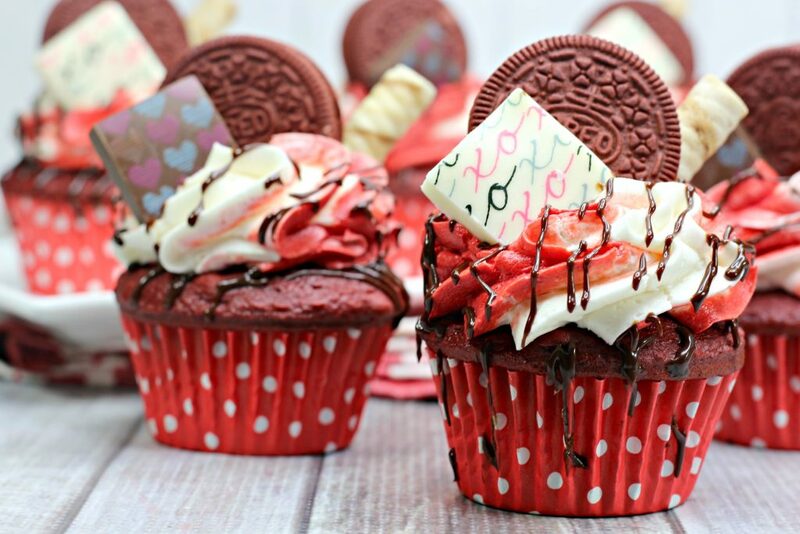 These ultimate sweetheart red velvet cupcakes are an extra special dessert perfect for Valentine’s Day or another special occasion. 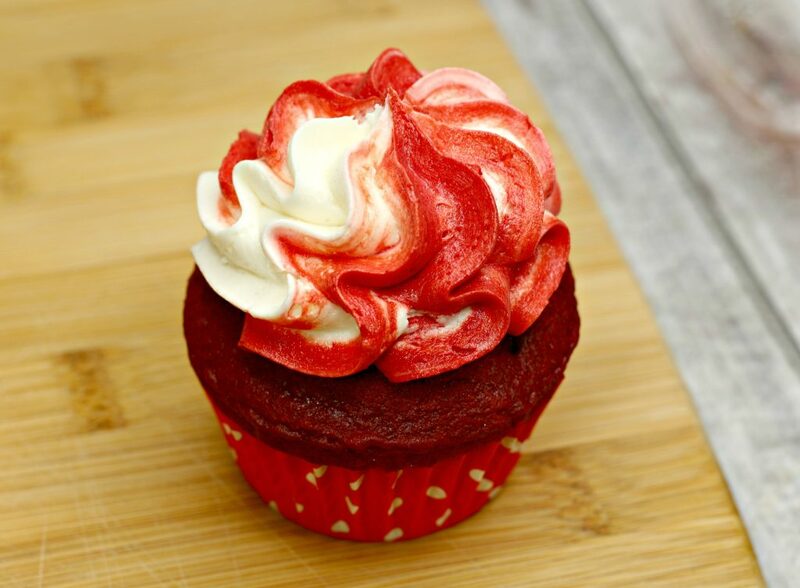 With rich red velvet cupcakes as the base and sweet, fluffy cream cheese frosting, these cupcakes are sure to delight. Homemade candy decorations make them even more special. Sometimes, things are worth making totally from scratch. These ultimate sweetheart red velvet cupcakes are one of those things. 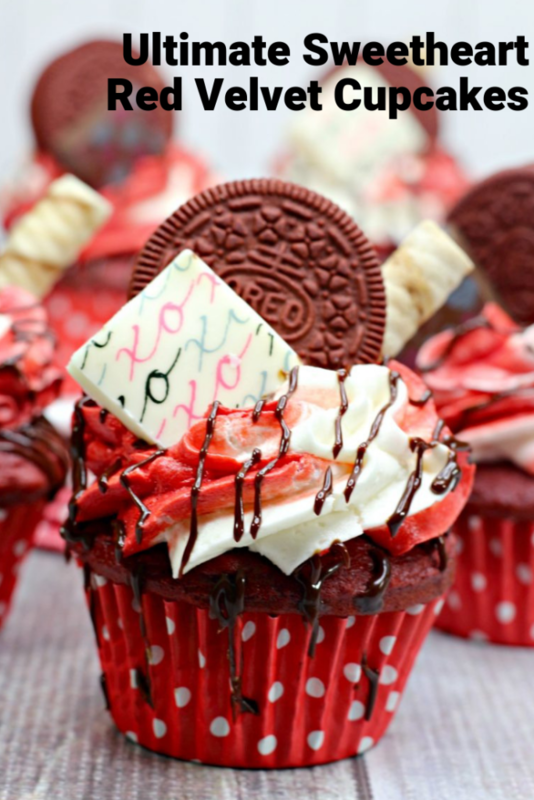 Everything in and on them- minus the Oreo topper- are completely homemade. Don’t let it intimidate you. The results are truly worth the little bit of extra work. 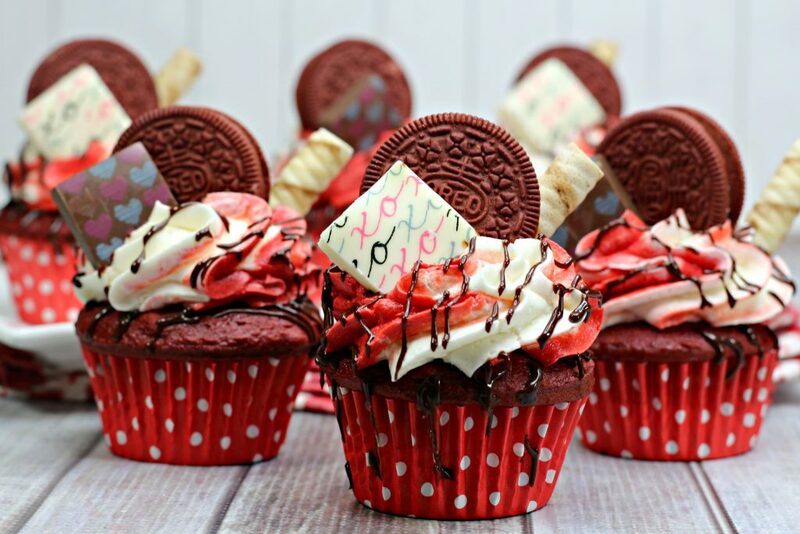 The resulting cupcakes are just so pretty with their festive candy toppers and gorgeous swirled frosting. They really deserve the title ultimate. If you’ve never made cupcakes from scratch, don’t let that intimidate you. All of the ingredients are pretty basic: flour, cocoa powder, eggs, baking soda, butter and shortening for extra moisture, milk, vanilla, and red velvet extract. Just a note on the red velvet extract. Don’t skip it. 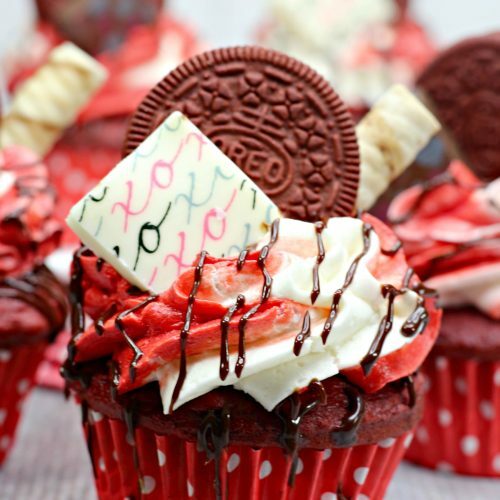 It adds so much flavor to these cupcakes. You can find it in the baking aisle of some grocery stores and in the baking section at craft stores. It’s also available online. Making cupcakes from scratch is not nearly as difficult as it sounds. Just whisk the flour, cocoa powder, baking soda, and salt together in a large bowl. Then in a stand mixer, beat the butter, shortening, and sugar until it gets light and fluffy. When that happens, add the egg, vanilla, red velvet extract and food coloring. Beat until just combined. To finish off the batter, alternate adding the dry ingredients and milk into the bowl of the stand mixer. Keep mixing until combined, scraping down the sides. Scoop the batter into a lined cupcake tin, filling each tin 3/4 of the way before baking. After the cupcakes come out of the oven and cool off, it’s time to put together the cream cheese frosting by whipping all the ingredients for the frosting together in a stand mixer. To get this fancy two toned effect, I split the frosting into two bowls. In the first bowl, I left the frosting as was. In the second bowl, I stirred in some red food coloring. Then I scooped the red frosting into a piping bag in 4 lines. Then I added the white frosting. To frost, I fit the piping bag with a large star tip and added a healthy dollop of frosting to each cupcake. Now for less ultimate cupcakes you could stop there, or you could top each with an Oreo and a drizzle of chocolate sauce the way I did. That could be enough, but it’s still not quite as ultimate as I would like them to be. So to really take these red velvet cupcakes and make them worthy of the name ultimate sweetheart red velvet cupcakes, I wanted to add an extra finishing touch in the form of homemade candy decorations. To do that, I used these Wilton chocolate candy molds and these Wilton candy transfer sheets. To make the candies, I popped the square pieces out from the candy sheet and then placed them in the square molds using the directions provided on the sheets. Then I scooped the melted candy melts into each square and let the candy harden. When it was finished, I popped them out and used them as the perfect topper. And the end result? Well let’s just say that your special someone’s socks will be knocked off by these ultimate sweetheart red velvet cupcakes. 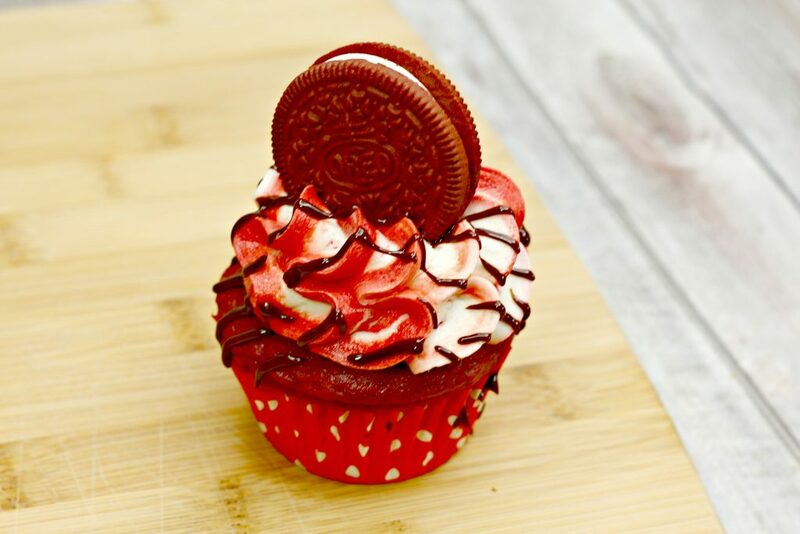 If ever there was a cupcake that was the perfect way to say I love you, these are it. Alternating between the dry ingredients and milk, Gradually mix in the both ingredients into the mixture until combined. Scoop batter into a lined cupcake tin- filling each cup 3/4 of the way. Bake in the oven at 350 degrees for 21 minutes. Allow the cupcakes to cool completely before frosting. This recipe was shared at the Meal Plan Monday link party. 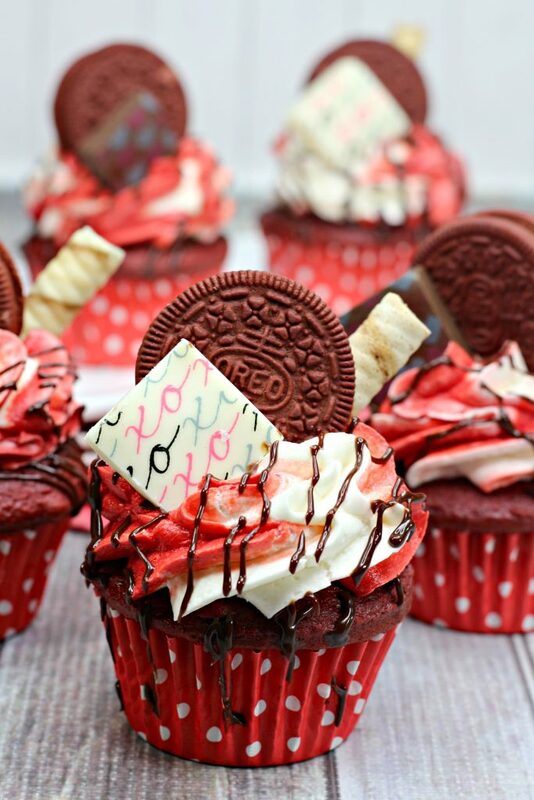 These cupcakes look amazing & undoubtedly would steal a heart! What fun! This is the perfect Valentine’s Day treat. Your cupcakes look scrumptious! Thank you for sharing with us over at Fiesta Friday! What a fun recipe! I love how cute they are.